PHILADELPHIA — Maybe it can all be chalked up to a lack of foresight by Democratic National Convention organizers. On Wednesday, the morning after Hillary Clinton became the first woman ever nominated for the presidency by a major political party, many newspaper readers across the country either didn’t see the news on their front page or saw headlines about history-making alongside a photograph of former President Bill Clinton. The latter was sadly what greeted readers of this newspaper. I get the constraints and preferences of the news business. Things have to be ready by a certain time, and editors want fresh photos to run with the news. The keynote speaker at the DNC Tuesday night was Bill Clinton, with Hillary appearing only via satellite. So, in this case, the news headline and freshest artwork didn’t align. 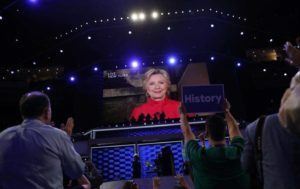 What continues to bother me, however, is that many editors — who I know to be good people with good intentions — likely didn’t grasp the significance or understand what Tuesday’s nomination meant not just to Hillary Clinton but to the half of the population that has been not-so-patiently waiting for this moment. Imagine the outcry if, in 2008, newspapers across the country had ran stories of the nation’s first major party black presidential nominee alongside photographs of Bill Clinton. Imagine if newspapers had chosen to bury the historical significance on inside pages. My hope is the insensitivity to this moment was caused by its expectedness. That is, I hope it was considered simply inevitable. But it is difficult to maintain that hope when I know that other political firsts involving women have been downplayed and, worse yet, have not resulted in an increase of female elected officials. Women are half the nation’s population yet, according to Rutgers’ Center for American Women and Politics, they hold less than 25 percent of elected offices nationwide. Compare the demographics of U.S. Congress with the national legislatures of other countries and, according to the Inter-Parliamentary Union, our nation ranks 96th, only 0.2 percentage points above Kyrgyzstan. Much of the coverage and process of the 2016 DNC has focused on easing the frustration of Bernie Sanders delegates. The political party, of course, wants the newcomers and returning voters inspired by that campaign to remain and to support the Democratic candidate. But women on the ground are quietly wondering if organizers bent so far that the historical significance of what’s been accomplished has been diminished. Glancing at the nation’s front pages, it would appear so. Women in the Democratic Party are celebrating their candidate, who happens to be a woman. But women throughout the nation, regardless of their ideology or support of this particular candidate, understand something amazing has happened that will forever alter reality for their daughters and granddaughters. We all heard the pane of glass break, even if we were denied a clear view of the shards the next morning.